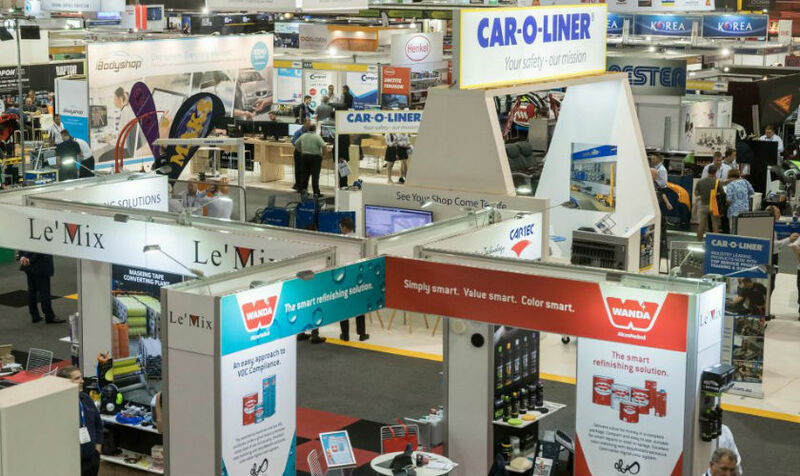 The high quality of exhibitors’ stands and the business improvement focus of the seminar program attracted almost 11,000 industry visitors to the Collision Repair Expo and the co-located Australian Auto Aftermarket Expo held at the Melbourne Exhibition Centre from 6 to 8 April 2017. “While around 26% of the visitors registered specifically to attend the Collision Repair Expo to explore its 70 stands, most people take advantage of the opportunity to see both shows. One amazing Expo statistic relates to the seminars. The themes and topics for the Seminar Program attracted 2,500 delegates. “We partnered with I-Car to create this Seminar Program and the standard of presentations and discussion was exemplary. We thank all those that contributed to this important learning and sharing experience,” said Stuart Charity. “The Expo has become an important industry meeting place and major contributions to networking at the event were the opportunities created by so many industry organisations choosing to co-locate their activities at the show. “Altogether, there were more than fifty conferences, meetings, workshops and launches held over four days filling every ‘nook and cranny’ of the Melbourne Exhibition Centre. “New Zealanders made up 70% of the international visitors and we thank the Collision Repair Association of New Zealand for again holding their annual Conference in tandem with Expo,” said Stuart Charity. A huge bonus for Collision Repair Expo visitors is the opportunity to see live demonstrations of virtually every type of surface coating product. The Exhibitors also relish the chance to show off their latest technology in front of a keen audience. Stuart Charity said this attraction is unique to this Expo. “There is nothing else like it at any trade show in the region,” he said. “The Lowbake Demonstration Spray Booth program was fully booked by exhibitors. And workshop owners and managers responded by filling most sessions and engaging in the interactive demonstrations. We congratulate Lowbake on their massive commitment to make this valuable contribution happen at Expo. “A new initiative for 2017 was the Brian Tanti Working Workshop. Renowned coach builder and Fox Museum Curator Brian Tanti held visitors attention during displays of techniques ranging from 100 year old panel shaping skills to today’s 3D printing technology,” said Stuart Charity. Stuart Charity said the Expo provided a great opportunity to showcase the scale and scope of the sector to Minister Sinodinos. “The exhibitors’ displays impressed Senator Sinodinos and gave him a different and more comprehensive perspective of the sector,” said Stuart Charity. “The overwhelming mood of Collision Repair Expo exhibitors was very positive. They were pleased with the enthusiasm of visitors and many said it was the best Expo yet,” said Stuart Charity. “With thousands of automotive professionals attending this convention, it will provide industry suppliers with an unrivalled business development opportunity in this large and important market,” he said. “We hope to build on the synergies we enjoy at the Expo with the collision repair sector and will welcome their participation in the convention. “The plan is to hold the Autocare 2018 Convention in Sydney in 2018 and the hugely successful Collision Repair Expo and Australian Auto Aftermarket Expo at the Melbourne Exhibition Centre from Thursday 4 April to Saturday 6 April 2019. “With this duo of major national events, the AAAA continues to provide leadership for the aftermarket sector with business development focused initiatives,” said Stuart Charity.